Tingling, numbness or a gnawing pain on the side of your hand by your thumb may signal carpal tunnel syndrome. When you sit at your desk at work and type out an email, do you ever notice tingling or numbness on the side of your hand by your thumb? Or maybe a gnawing pain in that same area? This kind of discomfort may signal that you've developed a common condition – carpal tunnel. 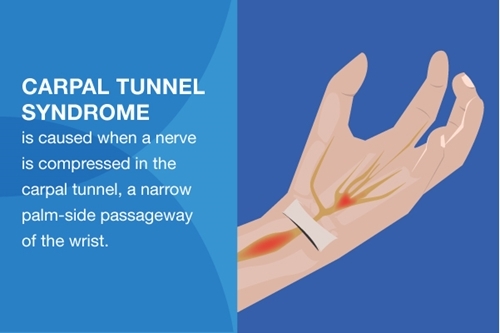 Carpal tunnel syndrome is a painful condition of the wrists and hands, which, according to Mayo Clinic, is caused when a nerve is compressed in the carpal tunnel, a narrow palm-side passageway of the wrist. Though pain is never fun in any setting, carpal tunnel can be particularly problematic if you work in an office where you are constantly engaging in repetitive motion with your hands and wrists, such as typing on a keyboard. The recurring movements, combined with improper alignment of the wrists and arms, can exacerbate the condition and make your workday extremely uncomfortable. Consequently, it's important to first identify what parts of your daily tasks could be contributing to the problem. "Think about the activities that you think may be causing numbness and pain in your wrist and try to stop or reduce them," Dr. William Seitz, a hand, wrist, elbow and shoulder surgeon, told Cleveland Clinic. "You can resume the activity when your symptoms improve." To minimize pain caused by carpal tunnel, you need to maintain proper wrist and arm alignment. Stabilize your wrist with a wrist brace that will keep your activities from putting stress on the painful area. Most options will still allow you to move your fingers freely, which means your workplace productivity won't be affected – you can still type and write as you normally would. If you sit at a desk working on a computer for most of the day, chances are that your hand is usually on a mouse. However, this angle can put stress on your wrist, your carpal tunnel. A mouse cushion, such as the IMAK® Ergo Non-Skid Wrist Cushion for Mouse can help adjust your angle, creating a more comfortable experience. Carpal tunnel is a painful condition that can make the workday difficult. Another way to protect your wrist is to skip the pad and opt for an ergonomic mouse. These options are specifically designed to keep your wrist and arm alignment in a neutral position, which limits the amount of stress on your joints. Similar to using a mouse, typing on a keyboard can also interfere with the alignment of your wrist and arm. Like a mouse cushion, a wrist cushion, such as the IMAK® Ergo Non-Skid Wrist Cushion for Keyboard helps to ensure that your form is correct, decreasing strain and increasing your comfort. Even though you probably spend a lot of time on your computer, there are nonetheless moments during the day when you record communications the old-fashioned way – with pen and paper. An ergonomic pen will help improve your alignment as you write, whether you're jotting down a reminder to yourself or taking notes during an important presentation. If you're experiencing symptoms that you believe may be caused by carpal tunnel syndrome, make an appointment with your physician for a diagnosis and treatment plan.